What would you do differently, if, somehow your life were rewound five, ten, or even 20 years back? Would you have furthered your education perhaps? Would you have started a business? Would you have made that investment you missed or maybe acted on a piece of advice that you now regret not having acted upon? Everybody has something that they would change, if they could. In hind sight, everybody’s vision is 20/20. 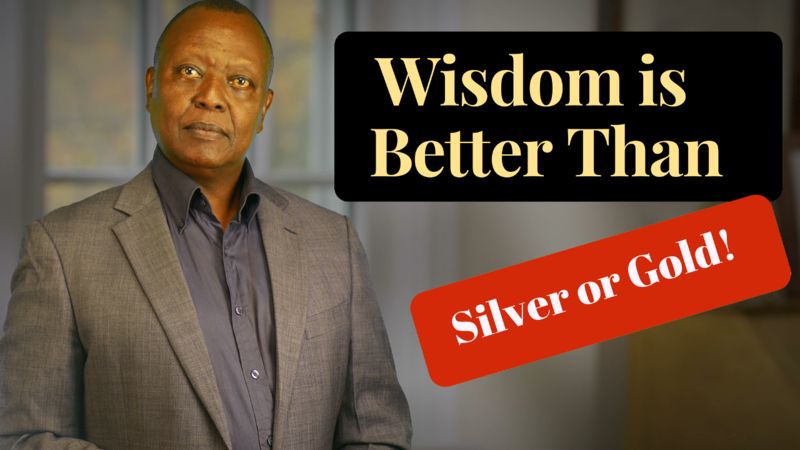 Today, we take a look at why wisdom is better than silver or gold and how it can help you avoid grievous financial mistakes that can ruin your life. CLICK HERE TO WATCH VIDEO. Through the centuries, wisdom gleaned from real life is well documented. We are advised not to spend all we have but keep some for the future. The dangers of ill-considered debt are pointed out to us in the saying “the borrower is slave to the lender” and also in the story of the shylock who demanded his pound of flesh. We are warned that by living on ill-gotten gains we are sowing the seeds of our own destruction. These old admonitions go largely ignored. CLICK HERE TO WATCH VIDEO. People want to have it all now. So we spend with abandon, borrow for superfluous reasons and try to make quick money in unscrupulous ways. After years hard work, most end up with empty pockets, clean bank accounts and a hoard of creditors on their backs. Wisdom can get you all the wealth you deserve, and more besides. For material wealth is not the most important thing in life, not by a long shot. Well known cases of extremely wealthy but desperately unhappy individuals testify to this. However one cannot ignore the fact that money is an important facet in the kaleidoscope of life. CLICK HERE TO WATCH VIDEO. Slow and steady investment is the more dependable path to success. A person who invests Sh 5000 monthly from age 30 will have Sh 9,488,175 at age 55 if the return is 12 per cent. To achieve the same result if one starts at age 45, one would have to invest Sh40,837 monthly and Sh115,027 if one starts at 50 years old. It becomes increasingly difficult to ensure a secure retirement the longer one delays to start investing for it. This means that the best time to start is as early in your career as possible. If you did not start then, there is nothing you can do to change the past but it is within your power to do something about your future by doing the second best thing; starting to invest today. They say that what you don’t know can’t hurt you, but is ignorance really bliss? Many people just drift through life without giving much thought as to where they are heading financially. As long as they have a job or a business that provides them with a subsistence level income, they just adjust their life to fit into the mold and live life as it comes. They are not aware that besides working hard, and looking for a better paying job, there is plenty more they can do to attain financial independence. Well, this ignorance really hurts them in the long run. As the years go, their children become older and their bills get bigger. They may be lucky to buy a house but then there is never any leeway in the budget to do the things they would really like to do or get the things they would really like to get; go on holiday, buy a better house, or better cars, take their children to better schools, build a classroom for the village school, and so on. Money is always so tight that they are trapped in their jobs which they may even hate but they cannot dare quit because the bills have to be paid. Let me tell you what happened to Miriam. Miriam was a mid-level accountant in an international NGO in Nairobi. She and her husband thought they were doing well and were not overly concerned about the future although Miriam was on renewable three year contract with her employer and her husband’s job did not pay well. Then Miriam was brought along by a friend to my personal finance seminar and everything changed. Miriam and her husband, who attended the next seminar I hosted, realized they were on the wrong track and completely changed how they managed their finances. Within a few years, they had bought their own house, had enough investments to take care of their children’s education, and were on track to financial independence. They were no longer held at ransom in jobs they hated but had moved to more satisfying and rewarding jobs. You too can make such massive changes in your life simply by improving the way you look at and manage your money. Thank YOU for keeping me company. I look forward to seeing you next week!